The Architectural Review provides leading coverage of the best in global architecture. The monthly magazine sits at the heart of the brand, providing an ultimate collection of the worlds most exceptional building projects in every issue. The ARs critical and truly global perspective positions it as a leader of debates and the one magazine in which architects aspire to have their work published. 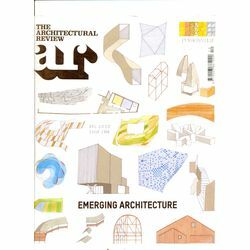 With stunning award-winning photography plus sketches, plans and insightful journalism, the AR has established itself as the worlds favourite architecture magazine. Approximately 20,000 architectural professionals in over 130 countries pay for the AR, and 87% of readers keep the AR for reference after use. The AR also caters for architecture and design communities around the world through its prestigious AR Awards events, celebrating the best in the industry and bringing wider international recognition to a talented new generation of architects and designers. The awards attract entries from more than 90 countries and provide a unique chance to profile, network and collaborate with key professionals.